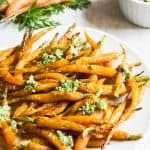 Maple Roasted Baby Carrots dressed with Carrot Top Pesto make a delicious sweet and savory side dish that complements any meal. This is a great recipe to have handy during the holiday season. And with this post my tale or series of recipes made with homegrown produce concludes. As you may recall, it all started this summer while we were housesitting for my parents, who are avid gardeners. I was a little behind with thinning out the newly sprouting root vegetables. I didn’t want to throw them all out, so I started experimenting with ways to cook the greens I had pulled from the garden. This resulted in yummy, garlicky sautéed beet greens and this delicious carrot top pesto. The newly sprouted carrot plants already had some super cute baby carrots attached (like I said I was a little behind), which of course I had to use as well. 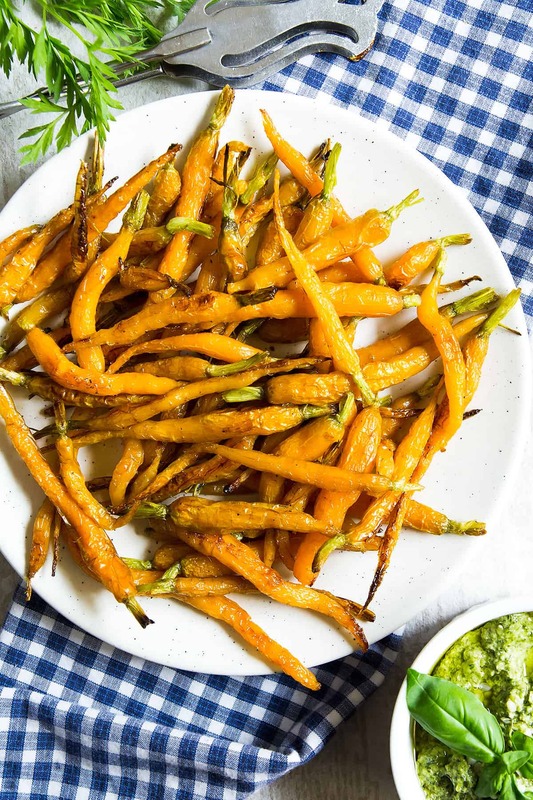 Now, you don’t have to use garden fresh produce for this glazed baby carrots recipe. Boy, that would mean you could only make it during a very short time frame each year. Which would be very sad. No, you certainly can use bagged baby carrots, or full-grown carrots cut into spears or slices – whichever you prefer. 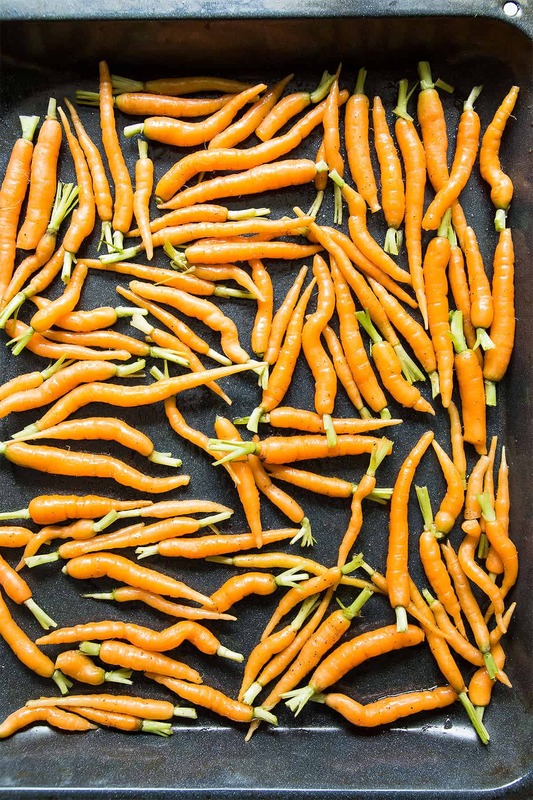 Alright, now that we have the type of veggies covered, let’s get on to how to roast carrots. This roasted carrots recipe is really super easy. Last year, I made a honey glazed carrots and sweet potatoes side dish. But for these baked carrots I wanted a simple maple glaze. You don’t even need a separate bowl for the glaze. Just place your carrots onto a baking dish, drizzle with olive oil and maple syrup. Then sprinkle on the seasoning. Use salt and pepper to taste and one other spice according to your preference or mood. Sometimes I use cinnamon for something almost like candied carrots. If I am in a spicy mood I use chili or cayenne, or cumin for more oriental-savory flavored glazed carrots. Toss around to combine, spread out and roast in the oven. Toss once more halfway through roasting and done. Simple as that! I am giving a ballpark time estimate of 25 minutes roasting time, but it will depend on the size and cut of carrots you use. And also on your texture preference. We like our roasted vegetables rather soft, while others prefer a little more bite or crunch. I am using a similar approach when making my Roasted Green Beans. After roasting, drizzle with pesto as the finishing touch. You can use any pesto you have or prefer, but I – very fittingly for a glazed carrots recipe – used this carrot top pesto. Serve these as carrot side dish for any meal you want. They are also great as warm or cold salad toppers. This maple roasted carrot recipe is perfect, if you end up on side dish duty for any of the upcoming holiday dinners. Sorry, I am posting this a few days too late for Canadian Thanksgiving this year, but I am sure you have plenty of other holiday dinners to attend still. 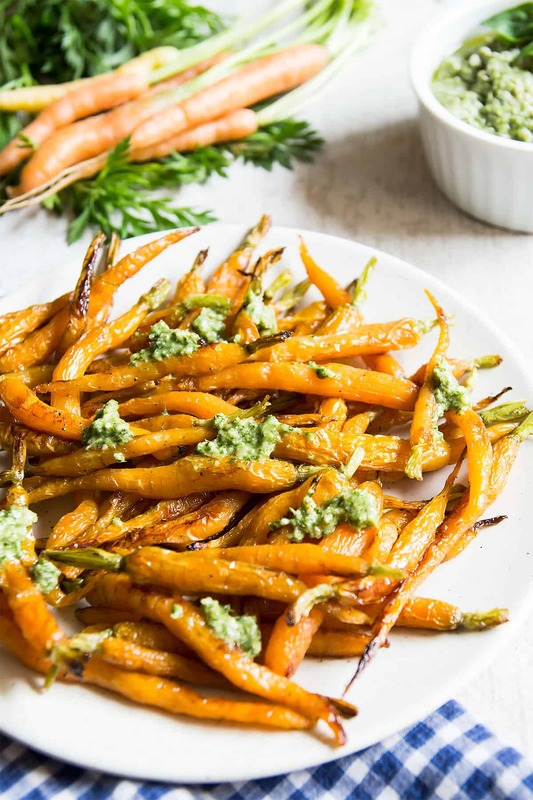 Maple Roasted Baby Carrots dressed with Carrot Top Pesto make a delicious sweet and savory side dish that complements any great meal. This is a great recipe to have handy during the holiday season. 1/2 teaspoon ground spice of choice depending on mood I use cinnamon, cayenne, cumin, etc. Place the baby carrots on a baking sheet. Drizzle with olive oil and maple syrup. Sprinkle with spice of choice, salt and pepper. Toss everything to combine, then spread out and roast for about 25 minutes to desired doneness. Shake the sheet about halfway through to turn/flip the carrots. 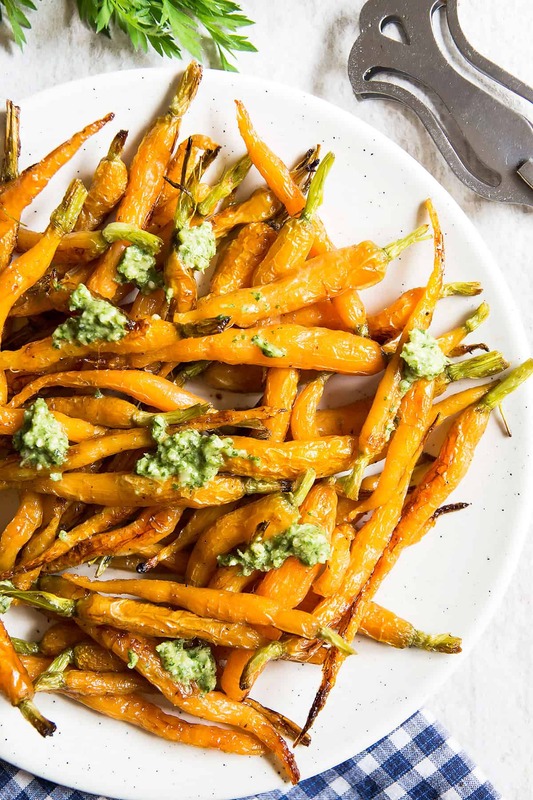 Drizzle the hot baby carrots with pesto and serve as side dish with your meal. Leftovers make great lunch salad toppers.